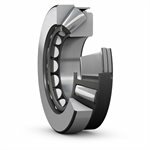 This type of bearing is characterized by its high axial load carrying capacity. It can also absorb considerable radial loads because the direction of contact is inclined to the axis of the shaft. The track of the housing washer is spherical, and the rolling bodies are barrel shaped. This makes the bearing self-aligning and therefore insensitive to misalignment.